In an effort to keep myself productive and meet lots of interesting people with interesting blogs, I've decided to join a couple of blog hops. 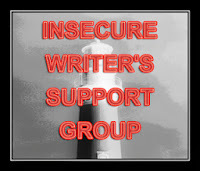 The first is the Insecure Writer's Support Group, hosted by Alex J. Cavanaugh. On the first Wednesday of every month, I'll be posting about the doubts, fears, and neuroses I encounter while writing my keister off. I'm chock full of those, so that should be easy enough. Next is the 2012 April A-Z Challenge, hosted by a slew of cool people. This is the one I'm worried about. In the month of April, I'll be attempting to blog every day except Sundays, with each post themed on a successive letter of the alphabet. It will begin on April 1st, with the letter "A." I don't know jack about apples or zebras. I'm terrified. But it should be fun. I'm compiling an alphabetical list of topics now in preparation. Glad you're on board for both!! Thanks, Alex! I'm glad to be on board. Just joined ISWG too, but haven't had a chance to post yet. I'll try to stop by next month too. I'll be sure to check yours out. Next month's will be interesting, as the IWSG entry will have to be alphabetized for the A-Z Challenge as well! Hey there, Author Alden! I think you have chosen well. These are two of the best blog hops out there imho. I'm looking forward to them! Thanks for stopping by. Hi there! I wanted to let you know I've tagged you. You can find out details on my blog when you have time. :) So glad you joined Alex's IWSG!